Kym Boycott is a Neurogeneticist at the Children’s Hospital of Eastern Ontario (CHEO) and Investigator at the CHEO Research Institute. She is an Associate Professor and holds a Faculty of Medicine Research Chair in Neurogenetics at the University of Ottawa. She completed her PhD, MD and FRCPC training in Medical Genetics at the University of Calgary. 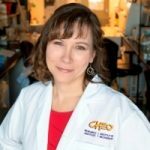 Her current research is focused on the identification of genes and molecular pathways for rare disorders and she is the Lead Investigator of the Genome Canada, CIHR funded ‘Finding of Rare Disease Genes in Canada’ (FORGE Canada) and ‘Enhanced CARE for RARE Genetic Diseases in Canada’ initiatives.